Literally a little something. 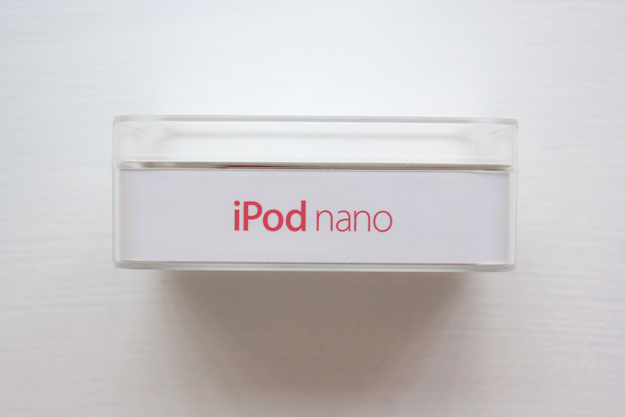 A new iPod nano! He took my not-so-subtle hintings and traded in my old iPod for a new one during a lunch break on his business trip last week. We’re calling it a very early birthday present (almost 2 months early). How sweet is he? The new interface is so different than my last iPod and I’m still getting used to it, but the headphone redesign is incredible and I’m so happy I can listen to music on my way to work again (my last iPod couldn’t hold a charge reliably for more than a day). It’s so cute! And tiny! And pink! Apparently everything I like is in miniature. I’m one spoiled girl. How was your weekend? Oh hooray for going for the mini cards! I was so tempted and then didn’t, but your logo looks great on them (and now I know what that gorgeous duvet from Friday reminds me of!). And what a dear sweet little nano. Next up, iPad mini? Just sayin’. A few years ago Neel and I had an unexpected babysitter and scooted out to a restaurant we don’t get to often (note to self, take Erin to Bardo). It’s sort of an Asian/Fusion tapas and we sat at the “bar” and had just the best time. Everything that looked tasty made us say, “Oh! We’ll try one of those!” Our wedding anniversary is in a couple of weeks (17 years, AACK), maybe we should go back. i love the mini moo cards and your header looks perfect on them. i use those little guys for product tags on my pillows (and feel free to send me the email!! i have made so many orders from them, i’d just love to place a free one!). that dinner sounds so delicious and your bf – so sweet! sounds like a pretty great weekend i’d say. 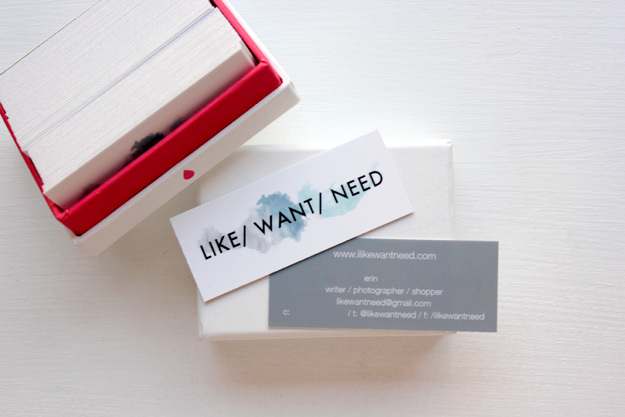 Your business cards are SOOOOOO beautiful. Good things do come in small packages! Your business cards look great and how sweet that J got you the Ipod nano! 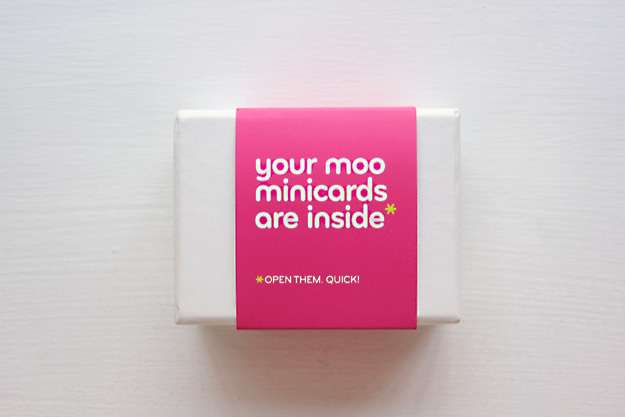 I have Moo mini cards too- and love love them. Boyfriend gets hints really well- a keeper for sure! I love the cards! Do forward me the email offer? I love how yours came out, and mostly, I love that they are small because your header looks perfect n them. That cocktail sounds like all kinds of amazing. And yay for gifts from the boyfriend! Thanks, Gloria! Productive weekends with a good balance of couch-surfing are my favorite kind :) I took it easy yesterday as a reward, haha. Awesome, Rooth! I don’t doubt people are impressed by them, they are pretty snazzy cards after all! Lovely boyfriend, what a super gent. There’s nothing quite as wonderful a feeling as a surprise from your loved one hey? 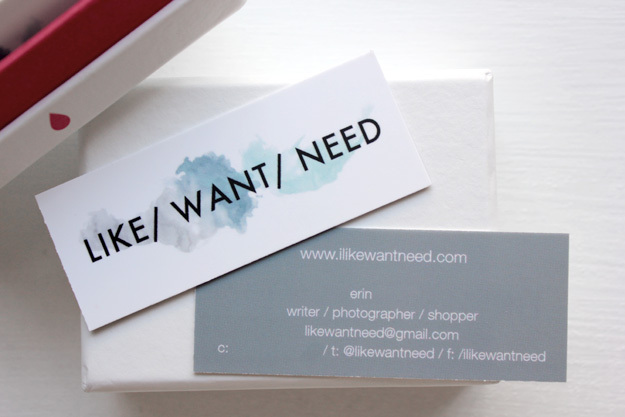 Your business cards are cute too and such a great deal too. :) Yeah, he’s a pretty good guy, I have to say. I don’t need fun presents to think that either, just in case he’s reading, haha. Thank you so much, Sam. You’re the sweetest! What a great gift! 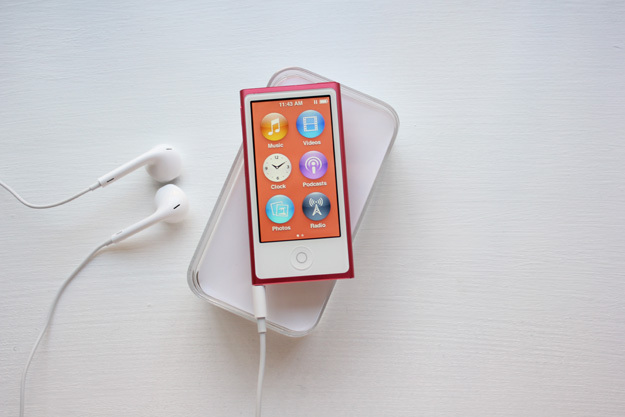 I could really need an iPod för when I’m running so tell me what you think of it :) Really like the cards as well, very classy. Thanks for your sweet comment on my blog by the way! Thanks, Christine! You should definitely get one, I imagine they make going for runs more enjoyable! And anytime, I hope you’re feeling better today! Love the mini cards, Erin! So stinking cute. My biz cards are handmade right now. Though, if I go to anything official one day, I may have to invest in an upgrade. Nooo! Penn! I loved his floppy, hirsute before-look. When I met him a million years ago it was during the first season and he had a shaved head. I much prefer the muppet-hair of season 5, personally :) I know, I know. I’m weird. What a great boyfriend. That ipod is so cute! Love those cards! I’ve not seen that shape before, they look really different.